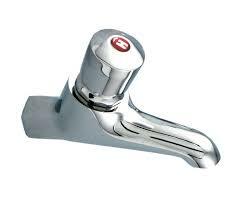 A few days ago I settled in the UK and noticed that hot tap water was not specific to Heathrow Airport. The only option in some toilets (e.g. in restaurants) is "tooooo hot" water. I cannot touch so hot water for even one second, otherwise it is painful. How can I wash my hands if hot water is the only option? As a British person I can say in this instance I just splash my hands, or move them in and out of the water stream very quickly. I would do in the winter when it is very cold, too, even when both taps are present, because splashing quickly with too hot water is often preferable to ice cold water. Also try using a different sink, because water usually cools in the pipes and/or takes a while to heat up, so you can often get a few seconds of cooler water if nobody has used the sink for a few minutes. If it is not possible to mix with cold water, I would suggest getting some toilet paper wet and use that (afrer cooling down) like wet nappies. If the water temperature hurts you, and there aren't other options, you simply don't wash your hands with that tap. I don't see many solutions... Use an hand sanitizer or some kind of cleaning tissue.. The general idea is that you plug the sink, and then fill it with both cold and hot water so the temperature in the water in the sink becomes manageable. You then wash your hands in the sink, and unplug it at the end. However not all sinks can be plugged (especially in public bathrooms), or you don't always have time to do the whole process. If your hand can manage cold water, then one of the way is to form a cup with your hand, fill it with cold water, then quickly move your hand with the cold water in it under the hot water to warm the contents up to a more comfortable temperature - the cold water in your hand will make sure you won't burn yourself. You'll then use the moderate water in your hand to do what you want, and repeat the process until you are done. If this is a common enough problem for you (and there is no hand sanitizer dispenser), you could carry hand sanitizer with you. As a British person I can say in this instance I just splash my hands, or move them in and out of the water stream very quickly. Doing something like this also works with a ordinary flame, too, e.g. you can pass a finger quickly through the flame of a candle. Do it quickly (and repeatedly if necessary): when your hand touches or passes through the water then it will instantly get wet, but not have time to absorb too much heat (note the difference between "temperature" and "heat", e.g. you can touch the outside of a metal kettle at 100C as long as you only do it very briefly). It's annoying to have to do it (I'd rather have cold or warm water than hot -- having only too-host may be unsafe e.g. for children) but feasible. ... suggests that at 65C it will scald ⚠ after 2 seconds -- however a fraction of a second might be safe. A metal water bottle may work. Fill it. It will take a few minutes to cool down but it is an option. You can rapidly cool the water by turning it into a mist. You can do this by putting a spoon under the tap. The reason it works is because you are increasing the surface area of the water which has greater contact with the cooler air around it. Carry a small (100-200ml) plastic spray bottle with you. Fill it slowly then spray it on your hands. The spray will be a lot cooler than the water. Of course you'll have to carefully rinse of the outside of the bottle between hands and when you've finished to ensure removal of cross contamination from your hands (because the outside of the bottle will have touched the hand you haven't washed yet). Water has to legally be 'stored' at higher than comfortable temperature to obviate the risk of legionnaires' disease, but cold water is almost always available, perhaps you were unlucky or the facility was broken. If you are unable to properly was your hands in an eating establishment after using the toilet that raises more serious health and safety issues about the establishment. If you didn't you should have left a written comment for the management. There is sometimes a hand sanitizer dispenser that you can use instead of the taps. I'm not sure I'd claim it's common, but there are enough places that have them that it's worth looking out for. Often, it'll be in some random place on the wall, like by the door. Alternatively, if there is a cold tap at the sink, you can just wash your hands with that. Soap and cold water is just as effective at killing germs as soap and hot water. There's usually a cold tap right next to the hot tap. My strategy is to cup my hands, fill them with cold water and add just enough hot water for the mix to be at a comfortable temperature.